What could be better than watching game 7 of the Stanley Cup Finals and cheering for Boston (my #2 team...Detroit is my #1)? We are a big hockey family and spend August to April at the rink. Oh right, so what could be better than......watching the game? Watching the game while making a Father's Day Card and writing this post! By now you all know - easy is what it is all about! 1. Cut the Ballet Blue 11 x 8.5 paper in half - 5.5 x 8.5 and score at 4.25. Fold and card should be 4.25 x 5.5. 2. Using your Cricut, cut the Trophy (Glitter Gold) from Sports Mania cartridge and the layers (Black) at 4.5 height (let the width set itself). Any trophy sticker would do too. 3. Adhere the Glitter Gold trophy to the card. Adhere the black layers to the trophy. 5. 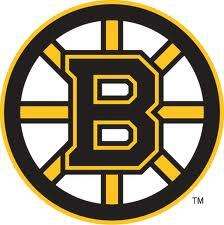 Cheer for the Bruins!!!! At the end of the second period it is Bruins 3 and Canucks 0. I really hope I have not jinxed them. In all seriousness this has been a great Stanley Cup Playoff. P.S. WOOOO HOOO!!!! Final score....Bruins 4 and Cancucks 0. Way to go Bruins!